The west of Glasgow is served by the Western Infirmary located on Dumbarton Road in the West End. It receives Accident and Emergency cases, acute strokes, orthopaedic traumas, emergency surgeries and intensive care cases. The hospital also specialises in cardiothoracic surgery and cardiology and renal medicine, including performing kidney transplants and general medicine. The outpatient West Glasgow maternity care centre is also on the site of the Western Infirmary. The WMCC has several outpatient clinics providing antenatal care, ultrasound scans and health education classes, along with classes and support groups for new mothers and physiotherapy clinics for expectant mothers who are suffering from back and joint pain. Of the many Glasgow hotels offering B&B accommodation, The Sandyford Hotel is perfectly situated for those visiting relatives or attending consultations at the Western Infirmary. We are just on the other side of Kelvingrove Park on Sauchiehall Street between the West End and the City Centre. At The Sandyford we pride ourselves on offering a quality service at affordable prices. 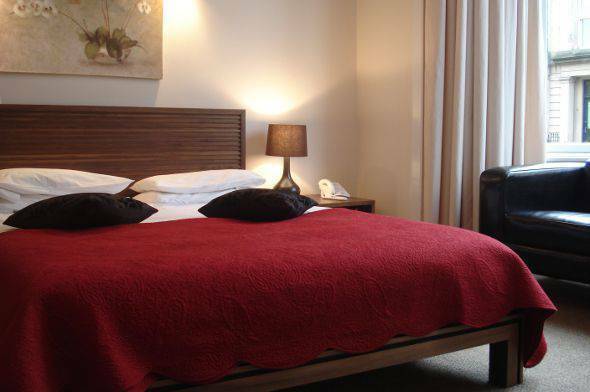 With 55 comfortable yet cheap bedrooms, The Sandyford Hotel provides en suite bed and breakfast accommodation for visitors and helps you to get the day started with a full Scottish breakfast. There are tea and coffee-making facilities in every room and a 24-hour reception to cater to your needs. Why not make a booking at The Sandyford Hotel today if you need to reserve a hotel room near the Western Infirmary. Our staff will be more than happy to take your call, answer any questions you may have and advise you on available rooms. Reservations can also be made any time day or night via the online booking form on our website. We�ll be happy to welcome you to The Sandyford Hotel if you are in need of a hotel conveniently located near the Western Infirmary.